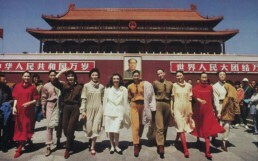 Laura Biagiotti was the the first Italian fashion show in China in April 25th 1988. This is a very special date for Biagiotti Group and for all the Made in Italy industry. Thirty years ago, the first Italian designer was officially invited by the Chinese government to present a special fashion show in Beijing. The show presented a panorama of the clothing that Laura Biagiotti designed throughout her career, especially garments made of soft cashmere from Mongolia and precious silk woven in Canton. Journalists from Italy’s most important media and Chinese authorities attended the historic event that was also seen by 200 million Chinese TV viewers on the Six O’clock News, which had never covered an Italian fashion show until then. “China was such a remote country that it was relegated to the limbo of my imagination, enriched by books I had read and by the art I had seen,” said Laura Biagiotti. “Bertolucci’s film “The Last Emperor” also re-introduced me to a recent past and the end of the last Ching Dynasty. 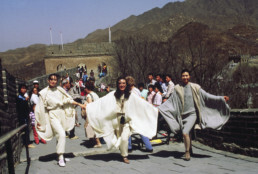 During my first trip to Shanghai in 1987, I was particularly struck by the extraordinary transformation that almost one billion people were experiencing by abandoning the Mao uniform and rediscovering their individuality through civilian clothes. This extraordinary phenomenon compelled me to follow my pioneering spirit and present my fashions to the world’s largest female community: 600 million Chinese women! The fashion show is naturally a brief, ephemeral event, but this time China deserved more: 150 outfits made of the finest raw materials of China and worn by Chinese and Italian models. Cashmere in natural shades, white, beige and lacquer red was used for track suits and hooded capes, and also for the babydoll dresses that I chose as the emblem of my career.